UN - 10 April 2015 – The United Nations Human Rights Office (OHCHR) today expressed concern by the continued and increasing use of administrative detention by Israeli authorities against Palestinians, who are being held without charge or trial, often on the basis of secret evidence, for periods of up to six months. 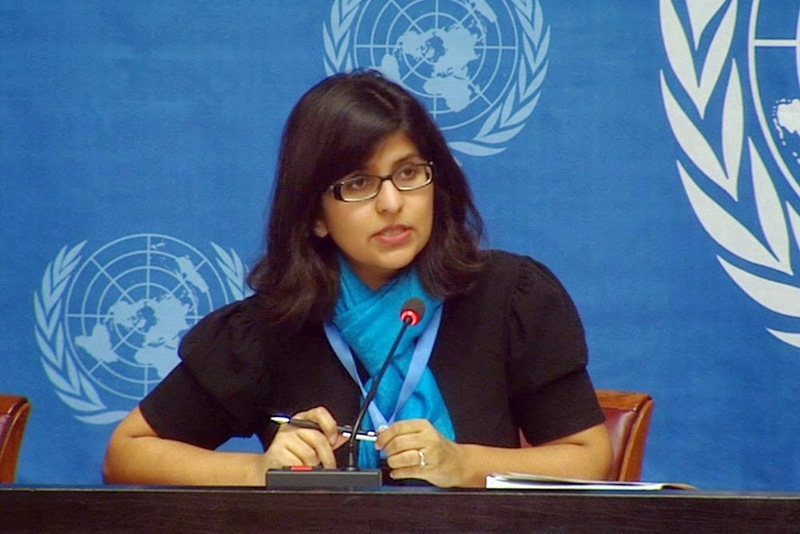 Briefing reporters in Geneva, OHCHR spokesperson Ravina Shamdasani said that detainees were also often transferred to prisons inside Israel in violation of the Fourth Geneva Convention. Most recently, Palestinian Legislative Council (PLC) member Khalida Jarrar was arrested on 2 April 2015 and subsequently detained pursuant to an administrative detention order issued by an Israeli military commander in the West Bank on Sunday 5 April. Ms. Jarrar remains in administrative detention in a prison in Israel. The order is currently under review by the Ofer Military Court in the West Bank and if confirmed, Ms. Jarrar will be subjected to six months detention, without charge or trial, renewable indefinitely. This is not the first time Ms. Jarrar had been subject to administrative orders by the Israeli military commander in the West Bank, said Ms. Shamdasani. On 20 August 2014, Ms. Jarrar received a military order giving her 24 hours to move from Ramallah, where she lived, to the district of Jericho where her movements would be restricted for six months. On appeal, an Israeli court reduced the restriction to one month. According to the press release, the Israeli practice of administrative detention has been condemned on numerous occasions by the UN Human Rights Office and the Human Rights Committee that oversees implementation of the International Covenant on Civil and Political Rights, which Israel has ratified. However, as of February this year, there are reportedly 424 Palestinians held under administrative detention orders – more than double the 181 held at the same time last year, said Ms. Shamdasani. OHCHR reiterates it call on Israel to end its practice of administrative detention and to either release without delay or to promptly charge all administrative detainees and prosecute them with all the judicial guarantees required by international human rights law, she said.